During the course of my career in social work, bereavement care, palliative care and as a hospice chief executive, I have seen end of life care in the UK improve dramatically. The services, facilities and expertise available to patients and their families are a far cry from those on offer at the beginning of my career. However, there are certain fundamental principles we still get wrong. A new report from charity Compassion in Dying – “I Wish I Had Known…” – suggests that end of life care requires improvement to make it truly person-centred. The charity recently celebrated the fact that it has supported 25,000 people to plan ahead for the end of life. Through these interactions it has gleaned vital information about how end of life care is actually experienced by those who receive it. The findings make for sobering reading. Compassion in Dying found that people diagnosed with terminal or life-changing illnesses often do not feel supported enough to make decisions about their care and treatment; they are not always given an honest prognosis by their healthcare team; they often do not know the full range of options available to them, and the implications of choosing or refusing each one; and they don’t know the right questions to ask their healthcare team in order to make an informed choice that is right for them. A YouGov survey of 1,680 adults, commissioned by Compassion in Dying and conducted in 2018, found that only 14% of people would feel uncomfortable having a conversation about their end of life wishes with a healthcare professional – yet just 52% would instigate the conversation themselves. RELATED: Why are we so reluctant to talk about death? Healthcare professionals need to be aware that many people do in fact want to talk about their death; often they just don’t know how or where to start. Compassion in Dying’s booklet, What Now? Questions to Ask After a Terminal Diagnosis, is designed to give patients confidence to ask questions about their care and treatment. The document is also a useful tool for healthcare professionals to guide such conversations. Another insight from the charity’s report is the importance of exploring each individual’s goals, priorities and preferences for treatment and care at the end of life. Place of death has become accepted as a proxy measurement for how well we are meeting, or failing to meet, the wishes of dying people, and it is correct that when asked most people say they want to die at home. However, the data on where people want to die is in need of greater scrutiny. Pain relief and retaining dignity often rank higher as patient priorities, for example, and a home death is not necessarily a good death if adequate support is not available. Advance care planning can be an effective way to explore an individual’s values and concerns. Beginning the process by asking about the kind of information patients might want to include in an advance statement (for example, religious beliefs, preferred place of care, who you want to be with you) can lead into more detailed discussions about what treatment they would or wouldn’t want in future, or whether they should consider an advance decision. Compassion in Dying has plenty of resources that can assist these discussions, such as the guide, Planning Ahead: My Treatment and Care. RELATED: How can advance care planning improve end of life care for nursing home residents? A culture change is needed that places dying people firmly at the centre of their care, and values the unique wishes of each individual. Nurses are in a prime position to lead this change; they already possess the necessary skills and experience, and their relationships with patients are often longer-term and closer than the ones patients have with other healthcare professionals. 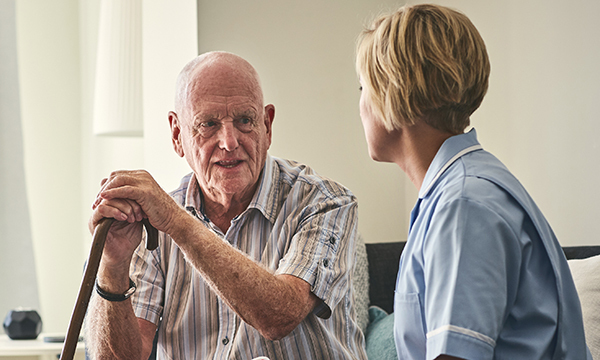 By ensuring that people with terminal or life-changing illnesses are central to conversations and decisions about their care and treatment, nurses can help make truly person-centred care the norm across the whole end of life care sector.